I wish I could take credit for the design of this card as it is so cute but I can't. 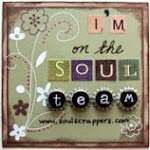 This was an idea from Stampin Up. The colour combo is so saffron and pretty in pink. I used chunky pink glitter and a sticky cut for the flower. Stay tuned for some of my valentine projects to be posted.